The 21st Century is SO Yesterday - BRIAN HOUSAND, PH.D. It is hard to believe that it has been five years since this article was published in Teaching for High Potential. At the time, it seemed like a pretty revolutionary idea. In the past few months, I have heard several others talking about when we are going to start thinking about the 22nd Century. I think that the time has come. Let's dig in! The admonition that we should be preparing our students for the 21st century is everywhere. There are numerous books, blogs, and content resources promoting and espousing the virtues of 21st century learning. If one examines the titles and descriptions of presentations at any gifted or general education conference, reference to 21st century learning is prevalent. Most of us in gifted education have regularly advocated for teaching 21st century skills. However, we have been living in the 21st century for 13 years now (UPDATE: It is now 2018! ), and if we are only now preparing our students to be 21st century learners, we’re showing up to the party very late. In fact, as the class of 2013 graduated from high school, consider that this group of students was always 21st century learners regardless of what they were learning or how they were learning it; they entered Kindergarten in the fall of 2000. So, maybe it is time to stop talking about the 21st century and start talking about the future. The idea of preparing students for their future is certainly not a novel idea. Indeed the opening quote from John Dewey in the early 20th century emphasizes this. In many circles, there is an impassioned call for STEM education and an increasing vocalization for the integration of the arts into a movement called STEAM. Yet, even these ideas are not new and can trace their origins back at least 30 years. In 1983, the National Science Board Commission on Precollege Education in Mathematics, Science and Technology published a report entitled, Educating Americans for the 21st Century: A Plan of Action for Improving Mathematics, Science, and Technology Education for All American Elementary and Secondary Students So that their Achievement is the Best in the World by 1995. This publication outlined many of the same initiatives and programs that we are arguing for three decades later. The executive summary chided, “America must not become an industrial dinosaur. We must not provide our children a 1960s education for a 21st century world.” Yet, some might argue that is exactly what we have done. It istime that the field of gifted education begins to re-envision itself not for the 21st century, but for the future that our students will live in. You may remember, or have seen reruns of The Jetsons cartoon. It originally aired in primetime from 1962 to 1963, and was set in a futuristic utopia of the year 2062. While we may not have flying cars, or robot maids, we do have access to many technologies that are even more advanced than those predicted. Today’s youth have grown up in a world with access to unprecedented amounts of information and media thanks to Google and YouTube. We are living lives that are constantly connected to others through our digital devices and social networks like Facebook and Twitter, and many children are learning to navigate an iPad before they are learning to walk. Technology is advancing at an almost unbelievable rate and forever altering the ways that we access information and interact with one another. As a result and perhaps for the first time, we are attempting to prepare a generation of students for a future that we truly cannot envision. Mark Twain once said, “There is no such thing as a new idea. It is impossible. We simply take a lot of old ideas and put them into a sort of mental kaleidoscope. We give them a turn and they make new and curious combinations.” It is in that spirit that I have given some of the concepts of gifted education and 21st century learning a “turn” to see what new combinations might emerge. These “new directions” are not necessarily “new” ideas; however, they represent a set of dispositions that could be helpful for our students to fully realize their potential. That being said, I invite you to gaze into this kaleidoscope to glimpse a guide for how to educate students for their future. One of the traits that is typically included on any list of characteristics of giftedness is curiosity. This is typically demonstrated by the incessant questioning of young children to develop an understanding of the world around them. Unfortunately, this innate curiosity is often squelched by an educational system that seems focused on indoctrinating students to become rule followers and better test takers. Yet, the concept of intellectual curiosity can be traced back to some of the earliest and greatest teachers including Socrates. In a meta-analysis conducted in 2011, von Stumm, Hell, and Camorro-Premuzic concluded that while intelligence is the single most powerful predictor of an individual’s academic success, effort combined with intellectual curiosity rival that of intelligence alone. They suggested that having a “hungry mind” is a previously underestimated factor related to students’ academic achievement. Perhaps, it is exactly this type of childhood innocence and curiosity that can help propel gifted students to be those who solve, rather than those who create the problems of the future. As we think about ways that we might engage students’ curiosity, consider one of the more interesting benefits that Google offers its employees. For up to 20% of the workweek, Google provides the time, space, and resources for employees to investigate, research, and develop something of personal interest. What would school look like for our students if we offered them this same benefit? Rather than force feed studentscurriculum or devote a day to test preparation, we could create an environment for gifted students to develop their talents and interests. While devoting a full day every week to this endeavor might not be realistic, we could easily provide a concerted effort to promote the development of curiosity in our students. One current technology resource to support this is Wonderopolis, which can be found at the website www.wonderopolis.org. Every day this website offers a new wonder of the day and includes many of the types of questions that gifted kids often ask, providing background information and extension activities related to the topic. While this website can serve as a spark to further student investigation, we should also encourage our gifted students to develop their own wonders of the day to share with their classmates and with authentic audiences. Chance is a concept or trait that plays a role in the Tannenbaum and Gagné conception of giftedness. However, consistently being able to find oneself in the right place at the righttime and interacting with the right people is not necessarily something that is accidental. Instead, these “chance” encounters are often the result of careful planning and engineering. As I think about finding oneself in the right place at the righttime, I am reminded of the Wayne Gretzky quote, “A good hockey player plays where the puck is. 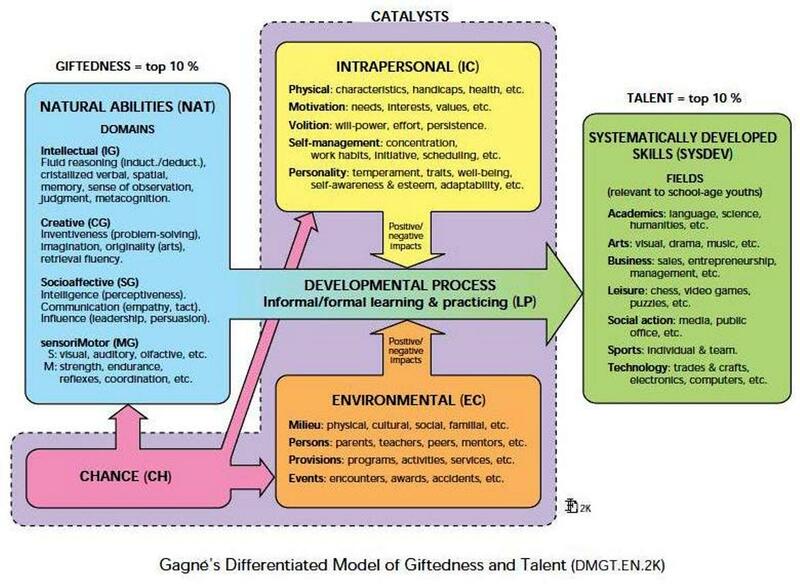 A great hockey player plays where the puck will be.” For gifted students to fully achieve their potential, perhaps we should help them develop strategies not only for goal setting, but also for creating an awareness of where their puck will be. Angela Housand has begun referring to this intentional professional goal setting as “future-casting” and is currently developing a series of activities for gifted students so they can become the hero of their own story. As teachers of the gifted, we can better help our students to engineer serendipity by encouraging them to surround themselves with like-minded peers who share common interests. In the 20th Century, consider the cultural impact of the creative enclaves such as Paris in the 1920s or Silicon Valley in the 1970s and 1980s. Life in the age of the Internet and social media has created opportunities for individuals to meet and interact with others who share common interests regard- less of geography. We must help gifted students to responsibly utilize social networks to construct their own Professional Learning Networks. However, we cannot assume that they will naturally understand how to do this. Instead, we should provide instruction and the opportunity to begin to learn digital citizenship in environments designed for use in education settings like Edmodo (www.edmodo.com). Edmodo is a system that allows students and teachers to interact with one another through a safeguarded Internet environment that includes discussion boards, messaging, file sharing capability, and so on. Additionally, we should encourage students to access and share ideas through tools like Twitter and blogs. We must help to transform students from simply being consumers of information to being responsible producers and contributors so that they may begin to engineer their own chance encounters with others who are making a difference. Much of the use of computers in school through the 1990s AND 2000s has focused on teaching students how to use a particular set of tools or piece of software. However because technology is developing at such a rapid rate this is no longer the most effective use of either the technology or the instructional time. Instead, we should begin developing in our students an understanding of design and how things are purposefully organized. It is inevitable that programs, tools, and interfaces will change; with the introduction of every new operating system or version of an application, something changes in the environment. However, if we had a deeper understanding of how and why things are designed, the period of transition and adaptability would shrink over time. In A Whole New Mind, Daniel Pink makes a case that design is one of the essential skills for the 21st century. However, examples of the intentional teaching of design are scant. To help our students develop an understanding of design, we might invest time in teaching visual literacy skills alongside more traditional literacy skills. This might resemble the use and creation of infographics, which are graphics designed to show large amounts of information quickly and easily. Examples of infographics include charts and tables or even a map of the bus lines in a city. We might also help students understand why websites have a particular form and function and that information is nearly al- ways organized in a similar manner. In much the same way that we have taught how an informational book is designed, we should also be sure to teach how the Internet is designed. By realizing that nearly everything is designed with a purpose, one can begin to decode and better understand how to utilize any tool or piece of information. Life in the 21st century is often one that is overloaded with information and external stimuli. We are constantly surround- ed by multiple information devices that beg for our attention. At any given moment of the day, we are almost always within arms reach of a device capable of connecting to the Internet. We are living in a time where students can access information anywhere and anytime with their “digital information devices” (DIDs), and if your students can Google the answer, then you may be asking the wrong type of questions. Gifted educators have long prized the higher-order thinking promoted by Bloom’s Taxonomy. Synthesis and evaluation have long been held up as a goal for teaching and learning. Interestingly, in the Revised Bloom’s Taxonomy published in 2001 two things happened. First, nouns were changed to verbs, and second, synthesis was exchanged for create. At first glance, this might not seem like an equivalent trade. However, Apple founder Steve Jobs effectively described the relationship in a Wired magazine interview. “Creativity is just connecting things. When you ask creative people how they did something, they feel a little guilty because they didn’t really do it, they just saw something. It seemed obvious to them after a while. That’s because they were able to connect experiences they’ve had and synthesize new things” (Wolf, 1996). Interestingly, in Five Minds for the Future, Howard Gardner outlines the importance of being able to synthesize. In this age of information, we have to be able to wade throughthe flood to avoid being overwhelmed. We need to be able to not only understand information, but to evaluate it as well. In traditional literacy environments, information typically comes from a single source such as a textbook, but the Internet and other media confronts students with volumes of disparate information and requires them to connect and synthesize to construct their own meaning. To be successful in these environments we must help students to develop a set of new literacies to make sense of the vast amounts of information that they encounter. In the 1970 book Future Shock, Alvin Toffler wrote that “The illiterate of the 21st century will not be those who cannot read and write, but those who cannot learn, unlearn, and relearn.” Indeed, perhaps this is the real goal of education. We simply need to develop in our students the ability to learn for them- selves. As teachers, our time with our students is often dependent on the length of the school year. As students grow older and the world advances, new content will be created, new dis- coveries unearthed, and new technologies developed. Much of the content that we teach our students today may become history by the time that they reach our ages. However, one thing that may not change is “GT” or “good teaching.” Noam Chomsky famously sums it up this way “That’s good teaching. It doesn’t matter what you cover; it matters how much you develop the capacity to discover” (Chomsky, 2003). Maybe that is what it is all about regardless of what you call it or what century it is. I like the 1987 INXS song. But the line from it is so ridiculous. You can't teach for a future you can't imagine. You can only teach history because you don't know anything else, the history of science, the history of geography, the history of history. In a way this is good so it isn't repeated from wars to the reinvention of the wheel. Teachers aren't smart enough to teach, especially not inquisitive gifted children. I was actively discouraged from studying nuclear physics on the side in early 1970s advanced program 5th grade from the classroom's otherwise untouched set of Encyclopedia Britannica. Teachers, who have been busy teaching because they were never gifted or motivated to do, largely teach what they were taught decades earlier, back to the beginning of free state education. You get what you pay for, occasionally. I became a computer programmer after being introduced to computers in my first year of college. What teachers are good at teaching is propaganda. They are all about deconstructing the civilization they live in, never liked or understood or got a decent salary at, and intersectionalizing their students into their own utopian fantasies. What they seem to be teaching for is a late-21st Century that looks like the Paris Commune or the revolutions of 1848. What schools really need is instruction at the earliest possible grade level in recognizing propaganda techniques and formal and informal logical fallacies so they can reject most of what they are taught, read, hear or see and not repeat it.